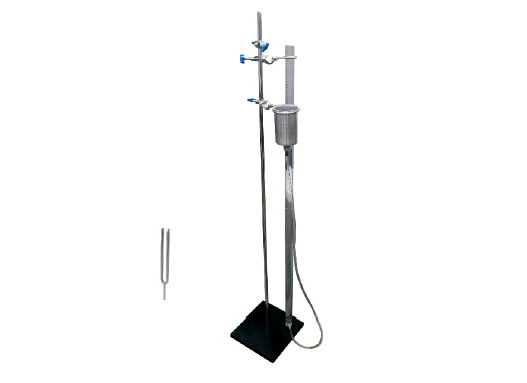 Used for determining velocity of sound in air or quantitative experiments on resonating columns. It contains a 120cm long plastic tube, graduated in cm. A water reservoir which can be easily moved up or down, connects the tube which is mounted on a support stand. A clamp for mounting tuning fork over the resonance tube is given. In the present setup, the length of the air column in the tube is adjusted by raising or lowering the water level until the column of air resonates at the same frequency as the vibrating tuning fork. By locating several such resonance positions and determining the distances between them, students can compute the wavelength of sound in air and its velocity.